Auburn, California, east of Sacramento on the way to Lake Tahoe, is probably not the first place people think about going, well that is unless you’re an endurance athlete, where Auburn is known (by official City Council proclamation) as the “Endurance Capital of the World.” Triathletes know about Auburn because of the half Ironman distance triathlon they have hosted there the last 15 years, The World’s Toughest Half Ironman. To say the ride is hilly is an understatement, and the run is also challenging, with over 1270’ of elevation change. Add in the weather, ranging from warm to very hot, and you have a very difficult race course. What sets this race apart from most other half Ironman distance races these days is that the race is run by what I would call a Mom and Pop shop, and I don’t mean that in a demeaning way. With the World Triathlon Corporation hosting their own Ironman and 70.3 Ironman Championship races most athletes these days head to those events for many different reasons, leaving the independent Race Directors (RD’s), to try and compete on their shoe string budgets. Independent RDs rely on local volunteers and sponsors to defray the cost of putting on such large races, while the WTC and other corporate run race organizations have deeper pockets and very little local flavor in their sponsor packages. As such many independent races have either been taken over by corporate RDs (and in some cases cancelled shortly thereafter), or have been cancelled as their numbers drop too low to continue. 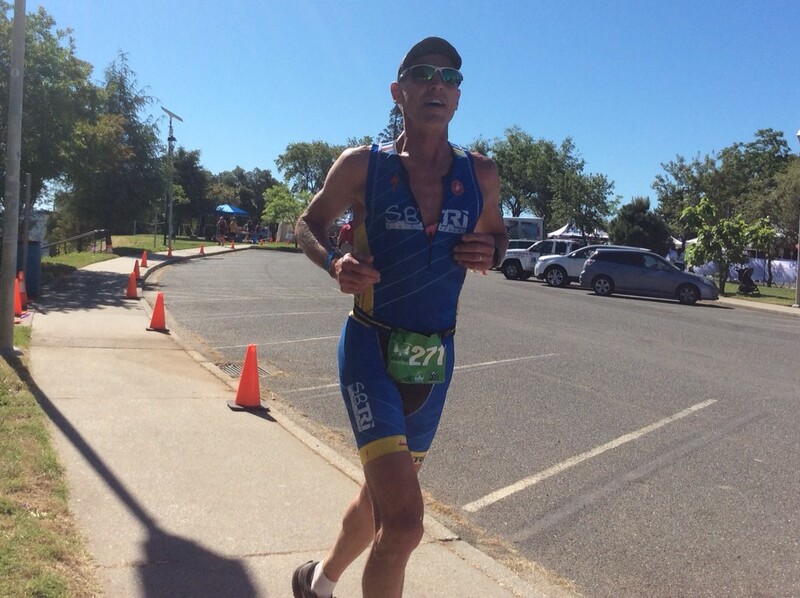 For us old timers in the sport this is a sad thing, losing the flavor of the independent races, like the Half Vineman swim in the Russian River, which is now the 70.3 Santa Rosa race at Lake Sonoma. At races like the Auburn Tri you can race the World’s Toughest Half, the International Tri (i.e., Olympic distance), and Mini Triathlon (i.e., sprint), in a unique venue that cannot support the 1000-3000 athletes that the “other” races support. As such you get a much more chill vibe at the race, a feeling that the race is being put on for the athletes and that the people in charge, more than likely endurance athletes in their own right, like Joe Pace and Colleen Conners-Pace, put the athletes first, making the courses as safe as possible while also making sure that the race is challenging due to the nature of the course, and not due to having to deal with thousands of other athletes in transition, at the swim start, and at the venue in general. I got to experience this race first hand this year, unexpectedly actually, after the people at Tri California cancelled their entire season at the end of last year based on the lack of water in the lakes they use for their races, principally Lake San Antonio for the Wildflower races. After reading a race review on WF last year by my friend John Nelson, saying how even though the swim at WF was different because they moved it to the other side of the park, where you then had to run two miles to T1 before hoping on your bike, that it was still “Wildflower”, and the race was still as epic and difficult to race as it was before, so that we shouldn’t ignore it because of the swim. Based on his comments and that I have raced WF 15 times before, successfully on most occasions, and that I would be aging up this year, I was ready to head there for my first race of the year. When Tri Cal cancelled their entire season I looked for another early season race and Auburn fit into my schedule nicely. I had never done the race so adding a new course to the many I have done before would be exciting. When Joe and Colleen took over the race from Brad Kearns they added the International and Mini triathlons to bolster their numbers, so I signed up for the International distance, my days of training to run a hard 13.1 miles, in the heat, behind me. Luckily my group of training partners was also adding hard races to their training schedules, like St. Croix, 70.3 Boulder, and such, with lots of climbing, so I had a ready-made support system and plenty of people to join me in my training. Another local friend of mine, Dave Parker, had done the Half at Auburn multiple times (5 or 6, he couldn’t remember! ), and was signed up, so I picked his brain and based my training off of his comments and those on the Auburn website which gave plenty of details. For those that were local to the race Joe and Colleen even supported a training day three weeks before the race, at their cost, to help athletes see and learn the course first hand. Who does that? The answer, nobody, well except independent RDs that really care about the athletes. When it finally came to the race weekend and the long drive to Auburn, over 400 miles, and I finally got to see the swim venue and drive the bike course, I was relieved and nervous; even after years of racing I still get butterflies when I think about toeing the line to go racing. The swim is a deep water start and with not a lot of racers in any of the races, there wasn’t the usual hustle and bustle to start. After I got in my “mandatory” long warm-up swim I swam to the start line and as we got down to the 10 second count down to the gun, off we went, no problems. The bike is uphill for about seven miles to a separate T2, which the International and Half distance athletes pass for their long out and backs, while the Mini people racked their bikes and did their single lap on the run course. International athletes returned for two laps on the run, the first one slightly longer, which mentally was kind of nice, while the Half athletes rode onward and upward to return in the heat of the day to the very long first loop on the run, finishing with their second loop being the shorter first loop used in the International race. I do have to include that there was a problem on the bike course, not with the markings per se, but with the volunteers at one intersection that sent people off course. If you had read the instructions on the website, or ridden/driven the course beforehand or just followed the actual markings on the ground, you were fine. For those that went off course, unfortunately their race ended with a DQ, as per USAT rules, specifically that “It is each athlete’s responsibility to know the course beforehand.” I don’t know how many people this affected, but I do know that the lead group of bikers on the course, i.e., the fast people, were not shown in the final results. So no times shown, even at the end of the list, with a DQ and the reason, big bummer for them, and for everyone else that did finish as they did not hold and awards ceremony while they were trying to sort out the results. In the end Joe and Colleen really had no choice but to go this route as the International race was a USAT Regional qualifier for Nationals, so you had to go by the book. Many athletes said they probably rode longer than they would have if they had followed the course, but all their challenges were for naught. Nobody feels worse about this than Joe and Colleen I’m sure, and with the number of athletes in the race dwindling from year to year, I can only hope that people will return to the race and try to make good next year and challenge themselves to complete the course and get a result. I guess in the end mistakes can and do happen with volunteers at all the races, even WTC sponsored races where athletes just recently have biked or run off course. I personally thought there were plenty of volunteers on the course, the aid stations were well staffed and had everything I needed, and that at least the International course was correctly marked. That and yes, I did go over the maps, I did drive most of the bike course, and I did see all the markings on the ground, just in case a volunteer stepped away for a short “natural break”, or just got it wrong. Would I go back and do the race again? The course itself was beautiful, the swim one of my all-time favorites, and the hills on the International distance race were hard but not over the top. I felt well prepared and with a little more time running trails beforehand to toughen up my quads, yes, I would do this course again. Of course now the fast guys know the course so I probably won’t find myself as close to the top guys in the overall standings! Going into this race I knew one of the fastest guys in the field was in my age group so I wasn’t thinking about where or if I would be standing on the podium, so I was more than happy with my second place finish to him, Dave Campbell. And by the way, with the DQ of all the early people on the bike course, Dave was the overall winner of the International race, so I guess I shouldn’t feel too bad coming second to him in my AG. And another reason to do this race again would be to continue to support the Independent Race Directors out there, to support them and all their hard work, giving back to the sport. And who knows, maybe someday I’ll do it again and Dave will be on vacation someplace else, you never know! Is There an Ironman Distance Race in Your Future? ← Are You a Lazy Runner? Your leadership in the triathlon community is so commendable. The detailed report of the race and the current status of triathlon is important. Fred, congratulations on a good race! And we have a great local race here in Santa Barbara run by Joe Coito for over 25 years now, a long course and two sprint tris, coed and female only, and even though they are doing well the numbers are dropping each year. All we can do is support our local tris and hope they weather the storm. Fred, thanks for the write up. I love this race and hope to do it again next year. My family has been helping at it for many years. One of the best, and I hope we can keep it around.